"EFI is particularly concerned by the European Parliament’s decision taken yesterday during the plenary session in Brussels to postpone the vote on Israel’s participation in the EU’s Community Programmes by 194 in favor to 173 against. Israel’s Participation in Community Programmes is meant to create trust, facilitate mutual understanding and encourage collaboration between Israel and the EU at the "People to People" level. By going against the position of both the Commission and the Council, the European Parliament has sent an unprecedented message to Israel that it does not consider it a partner. EFI is convinced that the EU has to continue on the path of peace promotion through dialogue. It is only by inclusion and not by exclusion of our democratic partners that true and mutual understandings can be achieved. Jean-Pierre Jouyet, French State Secretary for European Affairs, stated on behalf of the Council that "the Action Plan can bring the two-sides together creating a new trust between the partners on multiple levels. This way Europe can become more credible… not only in Israel but all ENP countries". Günter Verheugen (Socialist), European Commissioner for Enterprise & Industry stated that "Already in 1995 Israel commenced close cooperation in Research and Development and I saw first-hand the quality of its people, which can bring many advantages to Europe. Anything that can gather together the people and that can promote dialogue deserves our support. [Therefore], the strengthening of relations with Israel is in the EU’s interests." Ioannis Kasoulides, MEP (EPP-ED), asked "We do not have this political conditionality on issues of bilateral relations within ENP policies. In the case of Morocco for instance, we have never mentioned Western Sahara or human rights. Also in the case of Egypt or any country in the Mediterranean. I do not understand why this time we have chosen this political linkage." Charles Tannock, MEP (EPP-ED), stated "Israel and the EU share the common values which not all partners of the EU can demonstrate". 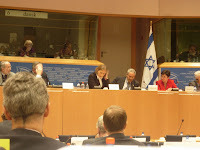 Elmar Brok, MEP (EPP-ED), Foreign policy coordinator of the European People Party, stated that the reason that was given for postponing the vote, the situation in the Gaza-strip, means supporting the illegal Hamas regime, which is decisively responsible for the situation in Gaza and the shelling of Israel." Surely now that the Israelis have withdrawn from Gaza the former Jewish setlements are flourishing as never before and producing even more crops under inspired new leadership. They set an excellent example of how productive the other areas under Israeli control can be once they are under Arab guidance. The European Parliament recognises this and favours Egypt and Morocco, both for their excellent example on human rights and their incredibly progressive agriculture and industry. It hopes that Israel can be brought up to their standard, hence the delay.